Sitting in front of you is a large block of clay. You're taking a sculpting course at a local studio. You've already learned the basics. You have the skills you need to create something all your own. And that's what your instructor wants you to do. Do you wait for someone to tell you what to create? No. Do you look around the studio hoping to find inspiration from your fellow students so you can follow in their footsteps? Hopefully not. Yet this is how many new freelance writers begin their careers. They wait on someone to tell them what to do. Or they look for someone to model their own business after. While I understand the temptation, neither of these is a great idea. Get help when you need it? Yes. Seek inspiration from colleagues who are now where you would like to be a few years from now? Sure. But you're building something completely new. 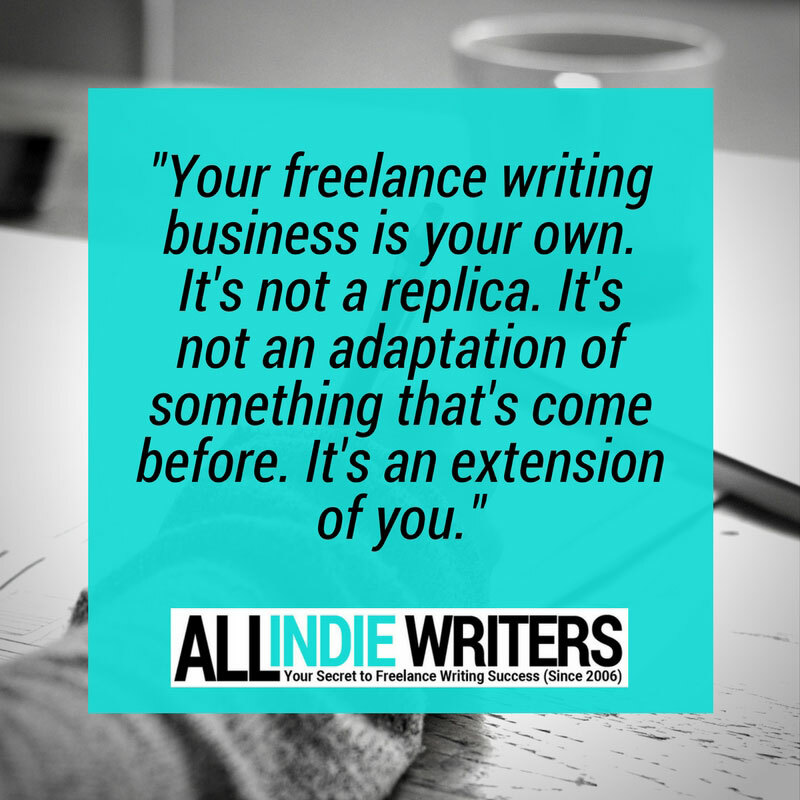 Your freelance writing business is your own. It's not a replica. It's not an adaptation of something that's come before. It's an extension of you. When you model your freelance writing career after someone else's, or after what someone else thinks your career should look like, you're living someone else's plan. What about that is going to motivate you when times get tough? Motivation is a personal thing. It's about what you are working towards. It's about finding enjoyment in your business instead of just slogging through, doing what someone tells you to. And, to some degree, it's about control. The more control you know you have over your career and the outcomes of your work, the more motivated you may find yourself to build good habits that keep you going. For this week's Monday Motivation exercise, think about your own career and how you can model it not on someone else's success or feedback, but on yourself -- your goals, your personality, your strengths. Take more control of your freelance writing business to build something that is both unique and inherently motivating. Think back to that block of clay. That's your career. So take control, get creative, and build a business that's yours, and yours alone. 1. Start with a sketch. If you're an experienced artist, you might be able to envision your finished piece and jump right into creating. If you're an experienced entrepreneur, you might already have a good idea what a successful freelance writing career would look like for you. But if you're newer, or you work best with a plan (many of us do), sketch it out so you aren't flying blind as you build. For your freelance writing business, that means thinking about your goals. It means knowing who your target clients are, and what's going to persuade them to hire you. It means understanding your competition and your place in the market. This is where it's okay to learn from others. Learn new skills. See how your competition is reaching a similar client base. Don't do these things so you can replicate someone else. Do these things so you can learn, and adapt, the basics to stand out. When you start a new sculpt, you're going to rough out a basic form. That means cutting out large sections of clay you don't need. In other words, get rid of all the crap that's in your way. Do the same for your freelance writing business. You've learned the basics. You've picked up new skills. You know what marketing tactics others are using. You've likely tried some of them. More importantly, you know yourself. Now is the time to make some broad decisions. It's time to figure out the basic form for your freelance writing career. Weed out marketing tactics that simply won't work for you. Cut out market segments you don't really care about reaching. For example, if you suffer from terrible anxiety over client phone calls, you might decide cold calling is a no-go for your marketing strategy. If you know you can't stand the politics of corporate culture and you'd rather avoid the "too many cooks in the kitchen" issue and work one-on-one with your clients, you might weed out bigger businesses from your target market. If you know you have a strength for persuasion in your writing, but you despise pushy sales tactics, you might choose to specialize in copywriting while never taking on direct marketing projects. Those were three early decisions in roughing out my freelance writing career. Did people tell me I was making mistakes? Yes. I was told cold calling was a must. I was told I'd never earn a decent living writing only for small clients. I was told I'd never earn more than piddly fees writing "soft" copy instead of direct sales pieces. When I bothered to respond at all, my response was simple: "Watch me." This wasn't blind faith or simple stubbornness where I stomped my feet and said "this is what I want, so this is how it's going to be." That's not you taking control of your career. That's you being a child. There will always be realities you don't love and things you have to do even if you don't want to (for me, that's largely on the administrative side). No. This was about me knowing my background and my strengths. I came from the PR industry. I knew about a side to the copywriting world that most direct response copywriters are clueless about. Copy and persuasion aren't always about sales. And sometimes other motivations of the client carry far more value. So I built my business around providing that value, and in the process I built a freelance writing business that looked very different from those of most of my colleagues. You can do similar. And that starts with roughing out your career plan -- eliminating the things you don't want or can't use so you can focus on building something of value from what's left. Sculpting is about more than removing clay as you carve out a finished design. Sometimes it requires a bit of building -- adding new clay or separately-finished elements instead of simply taking away. Again, your freelance writing career is similar. Roughing things out by cutting your "no way in hell am I going to do that" tasks is a great start. But you'll refine things as you go. That's why testing and measuring results is so important. What works great for one freelance writer won't always work for you. You are not them. Your target clients are not theirs. Your services, skills, and strengths are your own. It doesn't mean you did something wrong. It doesn't mean a tactic or tool doesn't work. It just means it's the wrong fit for your particular career. When this happens, you'll remove things from your business or marketing plan -- a service or a marketing tactic that isn't generating leads perhaps. At the same time, fine-tuning your freelance writing model may mean adding to it. Continued learning is important in any profession, and freelance writing is no exception. As you learn new skills or hear about new tools, you might add them to your marketing mix. This process of cutting things out, adding new goals and tactics in, and continually molding your career will last for years. You won't have a perfect plan on Day One. Tools and skills change. Your competition will change. Your market will change. And what drives you may change. You have to change with them. While the bulk of the freelance writing model you build for yourself is tweakable as you go, that doesn't mean you get to neglect the finer details. This includes your branding and the personal flair you bring to things. There's going to be some overlap in how you and colleagues run your businesses. But this is where you really set yourself apart. Bring your personality into the equation. Are you great at explaining complex topics to beginners? Take on a sort of teaching role with your clients. Are you funny? Bring humor into your professional blog or use it to your advantage during speaking engagements. Are you bluntly honest? Make it work for you. Shy as hell? More of a people person? A total tech geek? Don't shy away from it. Take whatever defines you, and use it to your advantage. You won't be just another generic freelance writer. You'll be one-of-a-kind. You'll appeal to a very specific type of client (ones who happen to be a perfect fit). And, oftentimes, you'll make yourself irreplaceable in their eyes. What kind of a freelance writing career do you want to build? Think about not only what will make you money, but what will make you happy. That's where you'll find your ongoing motivation. So, whether you're just starting out or you're unhappy with the direction you've taken so far, think of your business as an untouched block of clay. Learn from others. Know what's realistic and what's not. But don't simply mimic what you see and what you learn. 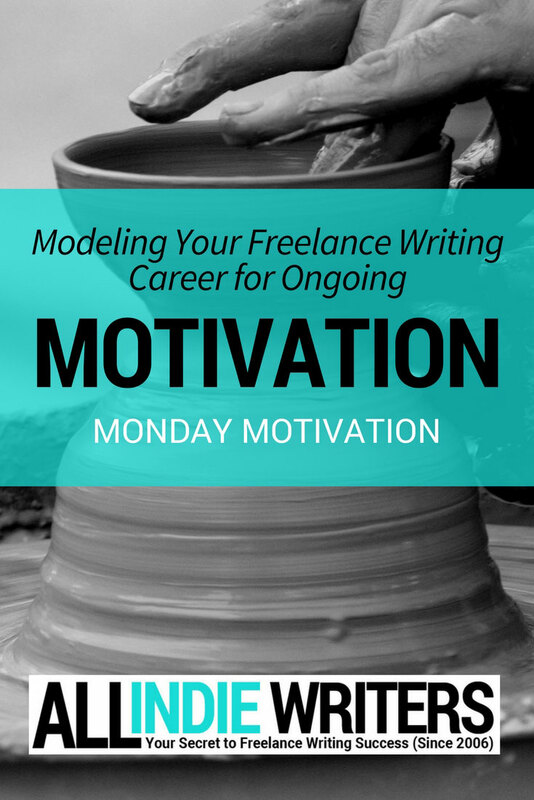 Model your freelance writing career around your own vision, goals, personality, and strengths. Visit the writing resources page for tools and worksheets to help you plan a freelance writing business while setting yourself apart.